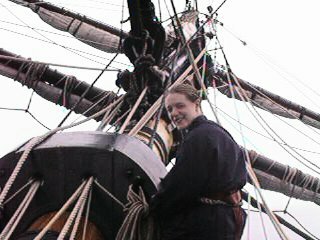 In April of this year, I sailed again as a member of the voyage crew aboard H.M.Bark Endeavour. 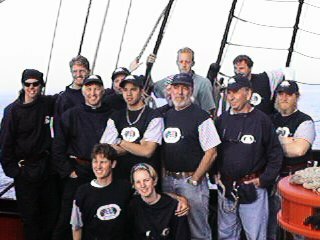 (See VOYAGE '98 if you haven't already) I got to revisit what I thought would be a once in a lifetime privilege, this time with an additional bonus. Two of my daughters, Rachel and Rebecca, joined the crew also! This vessel, a replica of Capt. 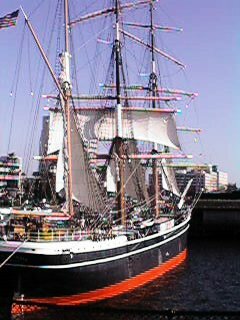 James Cook's ship, is a working, sailing museum making a round-the-world tour. We caught up to ENDEAVOUR in San Diego, where she'd just finished a winter refit after transiting the Panama Canal and spending Christmas in the Galapagos. We had a short time to see some of the sights in S.D., but our main interest was getting ready to sail. 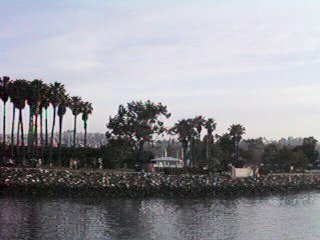 ENDEAVOUR was docked at the Maritime Museum, adjacent to the clipper STAR OF INDIA, the ferry BERKELY, and the steam yacht MEDEA. 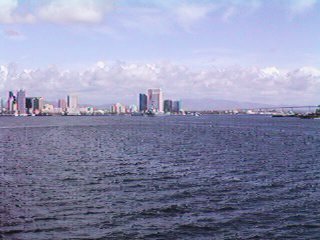 We sailed from San Diego harbor at 2 PM Monday, with a brisk breeze from the Northwest. 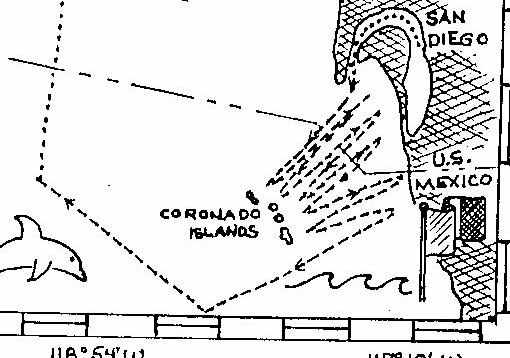 Unfortunately, that's the direction we intended to go, so we had to tack back and forth btween the Coronado Islands. A quick look at the track chart will tell you how unsuccessful we were! The current and wind were against us, and we slowly worked our way southward. We had plenty of practice wearing ship, though! 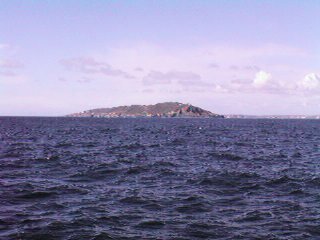 This is a view of South Coronado Island, which we saw ahead and astern too many times. In the meantime, there was work to be done. Everyone aboard stands watches, rotating through the various tasks. 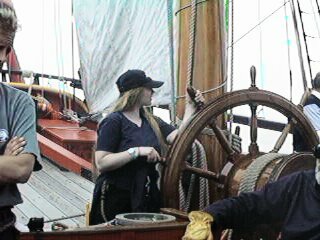 Bow and stern lookout, helmsman, sail handling and maintenance. 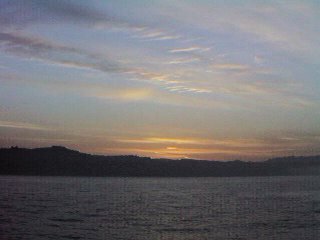 Two separate pictures showing the Foremast watch unfurling the Main Course early in the morning on Tuesday. Rachel and Rebecca are both up there. Can you spot them? You can be sure I didn't let them have all the fun, either! 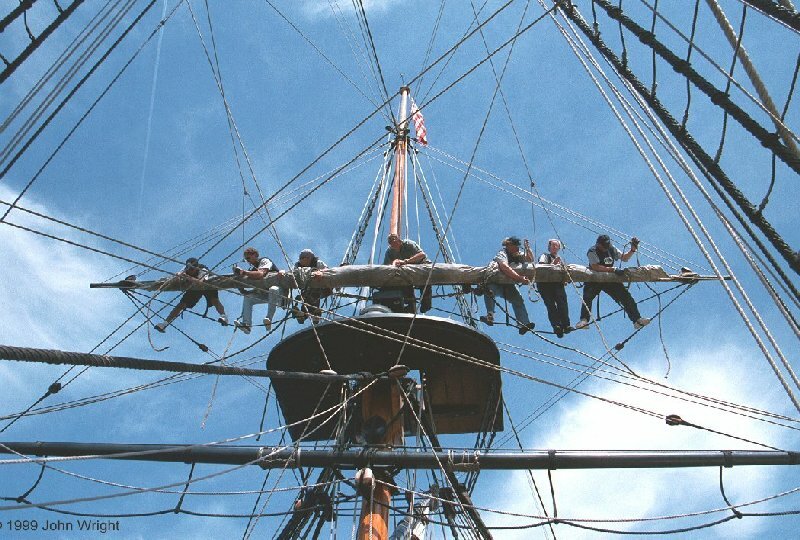 Here's a shot of me gasketing the Mizzen Topsail with a few of my mates. 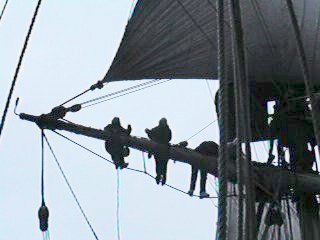 Thanks to John Wright for that picture from his camera, although the tricky fellow is also up there on the yardarm with me! Early sailors did all of their own sewing, and the needlework on the ship's canvas, too. Here the Foremast Watch takes a crack at sewing labels into the new "Driza-Bone" foul weather gear during maintenance time. Captain Blake (right) is checking out their work and ribbing them about their 'knitting circle'. 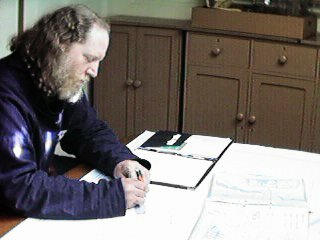 For me, the biggest thrill of the trip came when I was selected to draw the ship's Track Chart for our leg of the voyage. This is done on every section of ENDEAVOUR's journey. 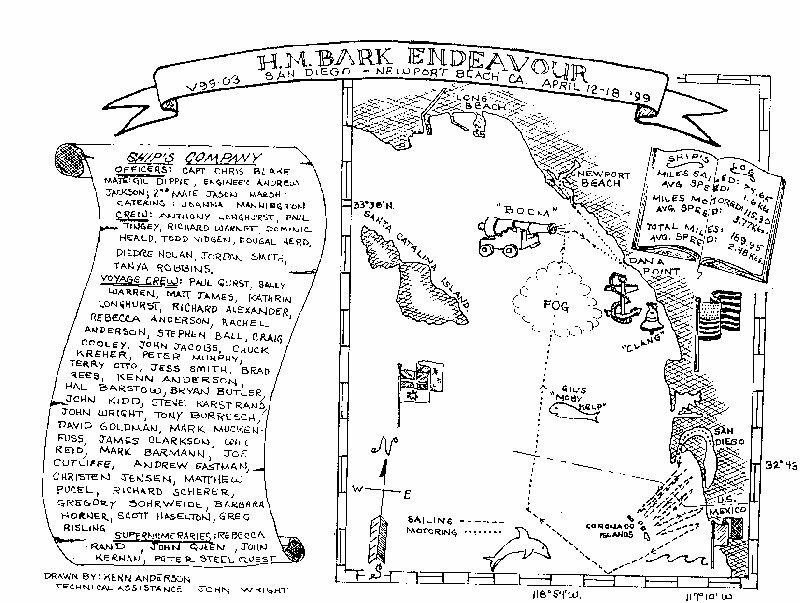 The track chart contains an artist's rendering of the route sailed, visual reminders of interesting events and sights along the way, and a listing of the entire crew for that leg. Every member of the Voyage Crew gets a copy as a memento of the trip. Since the Original ENDEAVOUR's mission was scientific exploration and discovery, Cook had several artists aboard. I spent quite a few 'off duty' hours working at the (replica of the) table where they worked doing similar drawings. 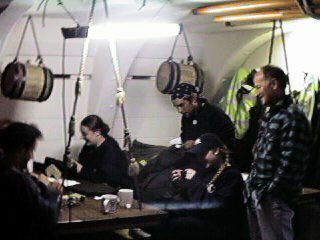 Drawing there, under a fantastic skylight, hearing the sounds and smelling the smells of the ship was a marvelous experience. I could imagine myself back 240 years ago as I heard the shouted commands and the duty watch's footsteps running to heed them. This was indeed a chance, not just to study history, but to recreate it. Here is a scan of the Track Chart in its entirety. Of course, all good things must eventually come to an end, and so did our voyage. We motored and sailed up the coast, encountering cold, rain, sun, wind and calm. We drifted through a night of dense fog. We saw beautiful sunrises and sunsets. 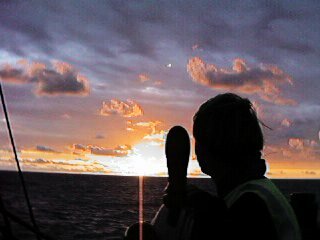 My favorite time at sea is sunset and sunrise, especially sunrise. 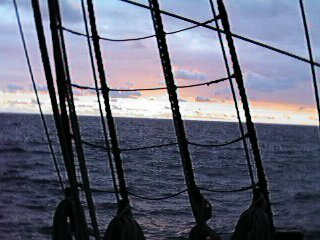 We encountered no pirates along the way, and the only natives to approach us did so in modern craft, offering us their warmest greetings. 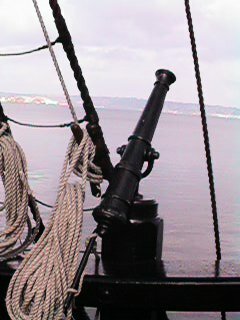 The swivel guns repelled no boarders, and our 4-pounders spoke only in salute. We stopped briefly in Dana Point that last morning, to pick up some dignitaries for the grand entrance into Newport Beach. Thus we relived another bit of nautical history, for this is the harbor that Richard Henry Dana entered in PILGRIM, about which he wrote Two Years Before the Mast. 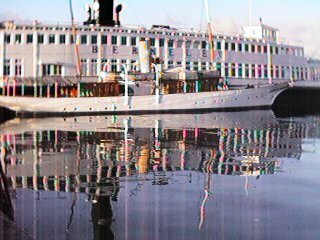 Much has changed here since his day, but a lovely replica of PILGRIM calls Dana Point her homeport. Speaking of fellow-rovers, here's the Mizzen Watch, of which I was a member. Dom Heald (in the green shirt) was our Captain of the Tops, keeping us straight in the drills. So many people, from such diverse backgrounds and geographic areas, we came together for a brief time and formed wonderful friendships. On a ship so small and crowded, there is little privacy and no secrets. 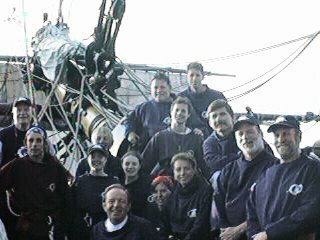 We truly had a fantastic crew. 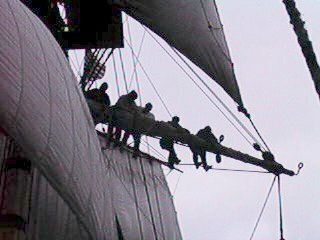 Here's the Foremast Watch, mustering near the bowsprit. This is a tired but happy bunch! Rachel and Rebecca served in this section, with Richard Warnett (second face from the left) as Captain of the Tops. I know they had a great cruise, as every time I saw them (which wasn't often, being in a different watch section) they were grinning from ear-to-ear.